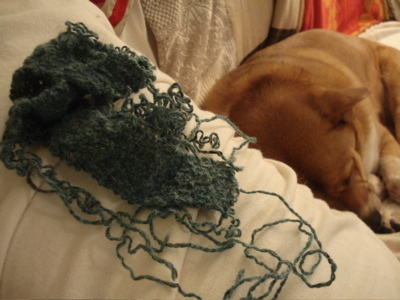 As you can see, I’ve been knitting away on the textured shawl this week. 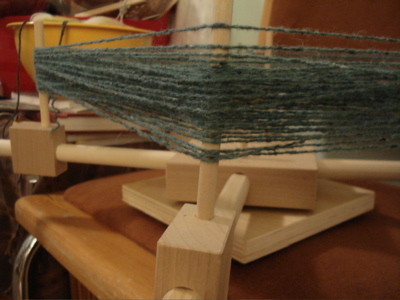 And last night, after a lovely late night beer and knitting date, I realized that I was getting very close to the end of my handspun. This morning, with my coffee, I knit a few more rows, and then gambled (poorly) about whether I’d have enough to bind off on the right side. This is a photo of the gamble, alongside my proposed solution. (Remember the sweater I frogged awhile back?) 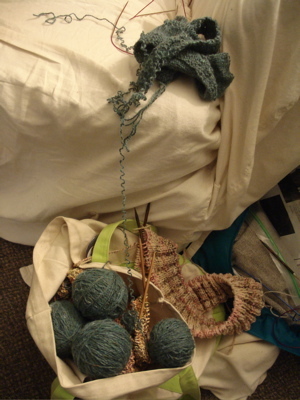 I made it halfway through the bind-off row when I ran out. Luckily, even though the Rowan Felted Tweed stands out against the backdrop of the textured shawl in this photo, one strand, on the edge of half the shawl, blends right in. I spit-spliced and continued binding off, and then raced against the clock to soak the shawl and pin it out before power-walking to campus to teach section this morning. 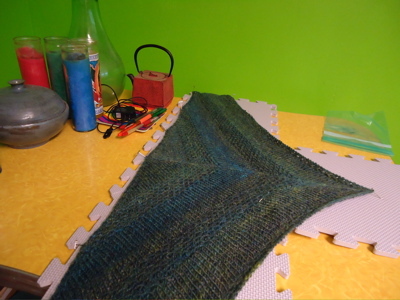 I stretched it out as much as I could, though the cast on edge is a bit tight, and I’m keeping my fingers crossed that the whole thing relaxes into a cozy, comfy, drape-y shawl. 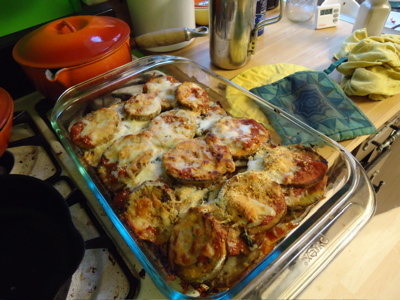 Last weekend I made a pan’s worth of eggplant parmesan using a big, beautiful farm eggplant. It was awesome. 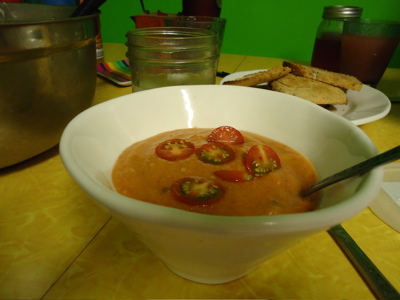 And last Friday (I think) I made gazpacho. This was so good. Exactly what I needed on a very sticky day. Here’s the recipe. We ate it with toast and cream cheese, and it hit the spot. I will definitely be making this the next time I have a handful of super ripe, juicy tomatoes. 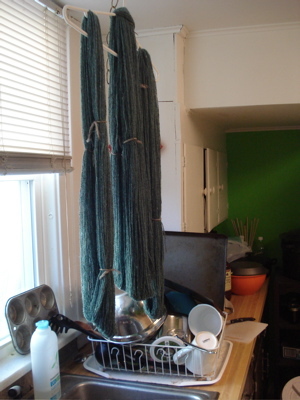 The yarn from my brompton grad school cardigan, hanging to dry. I read all your comments on my brompton cardigan, and I thought about what you said. 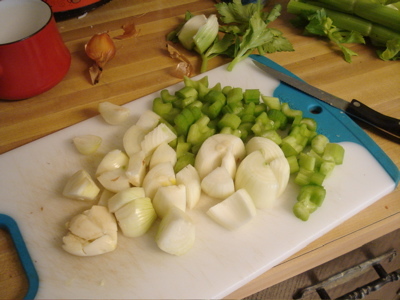 I thought about it while I made vegetable stock. I even asked Boh to think about it. Boh thought about it, and then he thought some more. 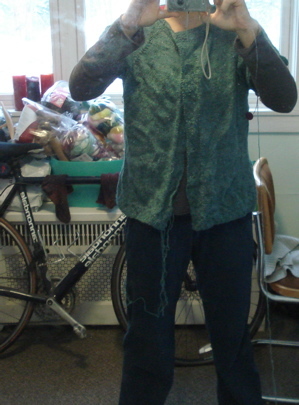 When I got home from yoga this morning, I ripped out the progress I’d made on one sleeve, and tried it on again. Definitely too big. 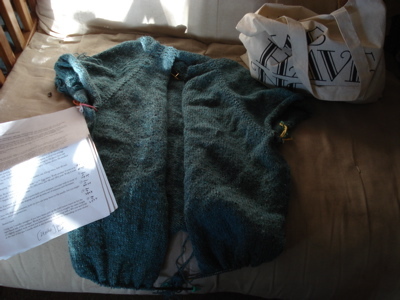 So this afternoon, I sat down and slowly picked out the seams connecting the basketweave button band to the body of the sweater, and frogged the whole thing. Well, all but the button bands. 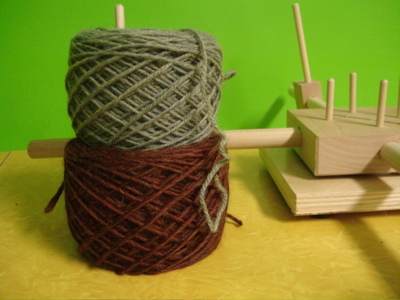 I might hold off on those until I absolutely need that yarn, because basketweave in a sticky yarn like Rowan Felted Tweed is a pain to undo. 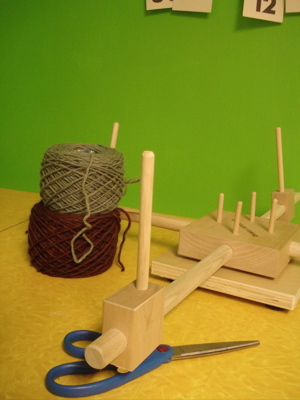 Later I’ll skein it up and wash it, and then it will be ready for a new project. I’m not giving up on brompton (still LOVE the pattern), but I’m not sure I have it in me to re-knit it out of this yarn right this second. Thanks, you guys. Ripping out this project was strangely liberating, and I’m excited to start daydreaming about what else this yarn might become. Yesterday I was feeling inspired by all of the “finish or frog” talk on ravelry, so I dug out my brompton cardigan and took some pictures. (I have to be honest: these are the good, hopeful ones. I have other pictures where it looks way too big.) See, I love this sweater. I cast on in January 2008 in Rowan Felted Tweed, imagining that this would be a cardigan I’d reach for often when I was in grad school. Fast forward two years: I am in grad school, I do wear cardigans, but this one isn’t done yet. I LOVE this pattern, love the yarn, and I don’t want to frog this, so here’s what I’m thinking: decrease as I knit the sleeves so that they are slim and fitted, and maybe only 3/4 length. The cardigan itself is light and drapey. 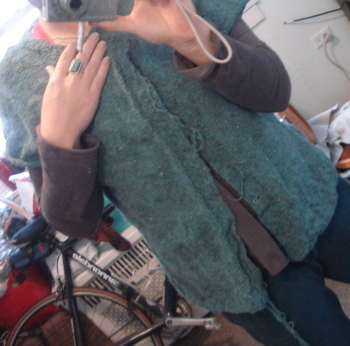 I’ll never wear this all buttoned up because of how big it is, but I could see it as a layering cardigan. I may be able to sew closed some of the button holes discretely (because of the basketweave stitch) and either give it an asymmetrical closure or one bigger button in the upper half of the sweater. It felt so good to finish 28thirty (thank you for all of your kind words) that I decided to take a look at my grad school cardigan (alice bell’s lovely brompton), so named because I was not actually IN grad school when I began this sweater in January 2008. 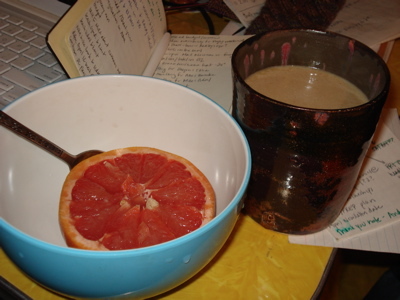 I envisioned myself wearing a cozy cardigan, drinking my morning coffee, and digging into exciting books. I’d say that’s pretty accurate, although I’m not sure I realized when I started this sweater how fast I would have to read, and how not-so-exciting some of the books would be. 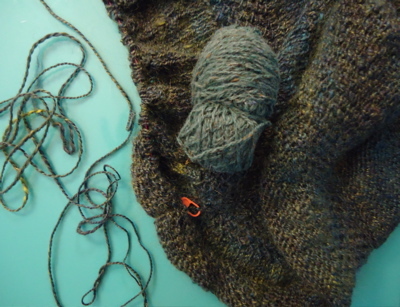 When I dug this particular WIP out of its tote bag, I found that I had knit and seamed one button band, and had begun knitting the second. This week, I’ve knit and seamed the second button band (and boy, has my seaming improved! ), and begun on the first sleeve. I’m pretty sure I can block the wonkiness out of the first button band, but my biggest worry is that it will be too big. I’m a bit slimmer (or so I’m told) than when I started this sweater, and I’m not sure I totally understood things like size, ease and fit. I’m going to pay particular attention to this as I work the sleeves, and hopefully after blocking I’ll have a drape-y, good-for-layering cardigan. Fingers crossed! Alright, time to get to (school) work! This is our first full week of glorious weather, and it is getting more and more difficult to be inside all day at the office. 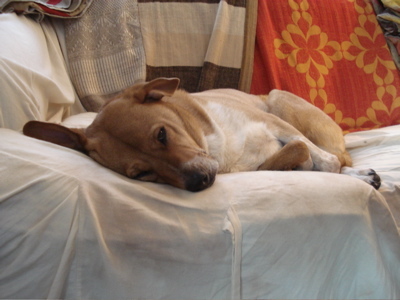 Weekend, please. Forgive the awkward light streaming through the window — couldn’t wait until later to share a Brompton milestone: I’ve completed the majority of the body stitches! Time to begin work on the button bands. 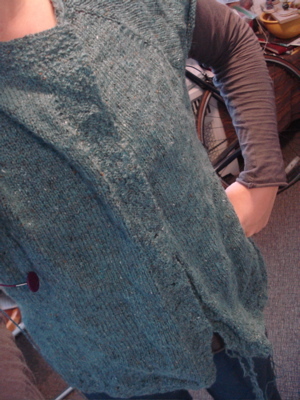 I say it every time I post about this sweater, but I love Rowan Felted Tweed. 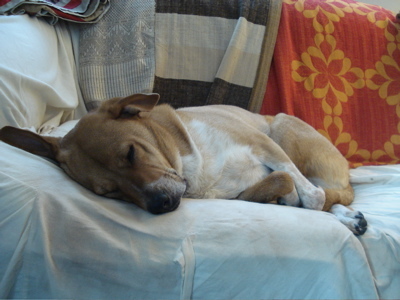 (Love.) Also, with the arrival of spring here in the Southwest comes the wind, and I am in serious need of a morning/evening layer like this one. I have some work and play travel coming up in mid-April, and I am hoping to have this done in time to take with me!